An unusually warm winter evening. Mid-January, no snow on the ground and the sky overcast, with the light nearly gone and nigh setting in. One the damp street, cars carried their owners homeward in a dense pack, heading down the hill toward the river. As I neared the plaza for the event (the screening of a new documentary), a small cluster of individuals with signs were gathering on the sidewalk at the entrance. Since I was running a bit late, I did not stop to talk, though I had wanted to. They were members of an advocacy organization there to protest the organization that made the film. On Wednesday, January 15, Autism Speaks, in conjunction with Massachusetts General Hospital's Lurie Center for Autism, held a screening of their new documentary, Sounding the Alarm. The group out front were autism self-advocates who were protesting the film because they feel that Autism Speaks siphons off funds from local communities through fundraising, then gives very little back, as well as their use of negative imagery and words. According to the Facebook event page, the film is described as resorting "to rhetoric of fear, pity, tragedy, crisis, and burden to talk about autistic people". At any rate, I made my way into the conference center where the screening was held, found a seat, and settled in to see just what all was in the film. The event opened with introductory comments by the Lurie Center's director, Dr. Chris McDougle, who began by citing the current estimated rate of 1 in 88 people in the U.S. having a diagnosis of autism, with the rate at 1 in 54 for boys. He described it as a public health issue and a "crisis", because once individuals with autism turn 22 years old, there is little to no support available for them. When he gives talks, he said, "99% of the audience has an image of a child in mind", they don't think about autistic adults. Dr. McDougle then talked about the Lurie Center's goal of providing support and treatment for autistic individuals "from birth to death"; the center includes physicians from all specialties who are educated about how to interact with autistic children and adults (e.g., consider sensitivity to light or sound, physical sensations, methods of communication, etc.). He also mentioned the center's policy arm, which works with legislators to address issues related to autism. Autism Speaks' president, Liz Feld, also said a few words before the film began, mentioning how Autism Speaks invested $50 million in institutions in New England. There is a "tremendous lack of awareness" of the lifelong issues facing families with autism. The aim of the film, she said, is to raise awareness of aging out of the support structure. After commenting on how a Massachusetts bill reforming autism legislation is a model for other states around the country, the lights darkened and the film began. As with Dr. McDougle's remarks, the film began with text, showing the prevalence of autism in the 1970s and moving through the two other data points we have on prevalence estimates since then, declaring we are "headed toward 1 in 50". The text fades and "Sounding the Alarm" appears in prominent letters. The screen goes black and "Battling the Autism Epidemic" appears in white text. There's a brief scene showing a little boy named Kristopher Wilson. His mother has brought him to be assessed for autism and we see him playing with some toys as a therapist tries to get his attention, before the scene shifts to an interview with Bob and Suzanne Wright, founders of Autism Speaks. "If this were an infectious disease, we would be all over this," Mr. Wright says, while Mrs. Wright recalls her grandson, Christian, being diagnosed. "I'm losing Christian." Their daughter, Katie, explains how she tried to get early intervention for her son, but everywhere she looked there were 6-month waiting lists, even if she "pads the pockets". Cut again to Unumb talking about an "autism tsunami". She mentions that lifetime treatment for one person will cost over $3 million. Noticeably lacking from this figure is the context: is that $3 million for a severely developmentally delayed, non-verbal, self-injurious person with no self-care skills? Is it for those with Asperger's Syndrome, who can live on their own with minimal or no additional support beyond what any other person needs? Somewhere in between? Bob Wright appears again, saying that even though state reforms have helped improve coverage through private insurers, it is a failure of Congress to act to reform corporate-sponsored insurance. An image of war. A marine (missed his name...Millsap?) was injured in Fallujah, Iraq. He has military insurance, but since he is retired, his insurance does not cover ABA for his autistic son. Next we have the story of Candi and Dan Spitz. Dan was the lead guitarist for Anthrax. He and Candi have twin sons, both with autism. They describe how they have had to sell their cars and get help from his mother to pay their rent. "If the day starts with a meltdown, it just gets worse and worse." They talk about how they have to turn down social invitations. There's a scene of Candi telling her sons that their dad is going to be gone for a few months. The segment ends with Candi crying on Dan's shoulder. "Why is autism on the rise?" The film notes that autism was "first described in the medical literature in 1943" by Leo Kanner, and asks "did it exist before 1943?" Dr. David Amaral, Director of Research at UC Davis MIND Institute says it probably always existed. (I agree, and, while Kanner may have been the first to describe autism as a distinct syndrome, he was not the first to note it.) Dr. Amaral describes how there is not a single gene behind autism, but a range of genes implicated in the spectrum of disorders, and that those currently do not account for all cases of autism. (Bob Wright appears again, stating there is "no such thing as a genetic epidemic".) Amaral mentions environmental triggers, such as parental age and environmental chemicals like flame retardants and BPA, being examined for possible connections to autism, while Dr. Irva Hertz-Picciotto, also with UC Davis MIND Institute, brings up nutrition and pollution as potential culprits. The Lurie Center's Dr. McDougle also appears in this segment, stating that with regard to vaccines and autism, for the typical person, vaccines are not going to cause autism, but that there may be a subset of people for whom it might. Toward the end of this section, Katie Wright again talks about the difficulties, about Christian "acting crazy" in public and how she does not like to think of the long-term goals. She comes across as frazzled and at her wit's end. Kent Martling, a 21-year-old autistic man who was in attendance at the screening, features prominently in this segment. He is shown learning how to take a bus on his own. He is described as "high functioning" and "functioning at the level of a 12 or 13 year old". When he turns 22, he will no longer be eligible for support services, while those who are lower functioning might qualify for support from state agencies. He is an articulate young man who says that he and his mother have talked about the possibility of him getting a job. As his story segment ends, he is shown packing to move, and his mother describes thinking about his future like looking into a "deep, dark well that has no bottom". Jim and Kim Piatek were also in attendance. Their son, Drew, is also 21, nonverbal, and was diagnosed at 3 years of age. He was doing well, hitting major milestones, but then in 2011 he began to develop severe OCD, to the point that it would take 3 hours for him to have dinner. He became angry and self-injurious, and his father bought protective equipment to wear when they had to move Drew from one place to another. They worry about him being abused, and that if they aren't there, he won't be able to communicate what happened to him. Mrs. Piatek says that they want their son to be happy. "If they don't find a cure, I at least want him to be autistic and be happy." The last story focuses on East End Disability Associates (EEDA), which offers respite care. One parent who utilizes the facility expresses a measure of distrust that a group home could provide good, loving care. "I want to kill him sometimes, so how can someone who makes $12 an hour" care for him, she asks. Another client, Matthew, is shown. He has autism and Down's Syndrome. He is very self-injurious, and his mother says she feels "like I'm failing as a mother". EEDA has been involved in protests, along with 32 other agencies that provide support services, against state cuts in funding to organizations like theirs. The film notes that autistic adults find some amount of employment at places like Home Depot and McDonald's, then highlights John D'Eri, who started a car wash focused on employing autistic individuals. The inspiration was his son, who has autism. The business employs about 35 autistic adults, roughly 85% of their staff. Those with classic autism are described as the best employees: they can be given structured, repetitive tasks. Some of the employees are asked what they like about working there. One likes shining the tires, another like the money and hours, and another mentions he's happy because otherwise, he wouldn't have a job. "I've applied to so many jobs and they won't hire me." The scene returns to Kristopher Wilson, who was introduced at the beginning of the film. He gets a diagnosis of autism, and his mother starts crying, but she says they are not tears of sadness; they are "tears of joy to have a relief knowing what's wrong." The film ends with images of Christian Wright and his family in a pool. As the lights came up, the floor was opened for questions. One woman whose daughter has autism and whose son has OCD asked what the impact of the Affordable Care Act would be. According to Liz Feld, the ACA lets the states decide if their health exchange will cover autism treatments. Autism Speaks is reportedly working with the Department of Health and Human Services to get autism listed as an essential coverage by 2016. Another parent commented that it's good we state-by-state insurance laws, but that unless legislators have a kid with an ASD, they just won't get it. Donald Washington, an autistic adult who started the Missing Pieces Project, liked the film. The spotlight on employment hit home for him, and he noted that "all we look for is acceptance". He appreciated that the film was made, because it lets people know what autism is like. He ended by saying that speaking up is the most important step. Liz Feld responded, saying that they use the car wash scene to show employers and families what can be done and to inspire them. Susan Senator brought up a statistic from the movie that over the next 10 years, approximately 500,000 autistic people would be aging out of services. Happy that they included that figure, she also urged Autism Speaks to consider shifting their money around, perhaps by drawing some away from research and putting it into employment and housing services. It needs to increase from the current $8 million AS spends on support grants. I encourage you to read her account of the evening. She has some good insights into the good and bad points of the film. There were some other comments and questions that I missed, but Liz Feld ended on the subject of wandering. With more and more media attention recently, "it has reached a terrifying level". She recommended that families talk to first responders and neighbors when they move into a new area to raise awareness. She used the example of a young boy that wandered off in the middle of the day and is still missing. There were positive moments in the film. I agree with the call for insurance reforms and increased support services and awareness education. But there was an awful lot wrong with it. The overall framing of the issues was such that it used negative imagery and fear to try to get its message across. Many of the stories (in particular Katie Wright and Candi and Dan Spitz) would make someone who knows little to nothing about autism terrified of an autism diagnosis. There was a lot of focus on how difficult these families had it. The balance was definitely tilted toward those families who are dealing with the more severe end of the spectrum. I know that autism can be challenging and exhausting for everyone involved, from the autistic person themselves to their parents, siblings, teachers and so on. I get that. But there is so much more beyond the negative, the fear, the tears. When I very briefly caught the filmmaker, John Block, afterward and asked where the film is going from her, he said that it's mainly going to be at similar venues and "preaching to the choir", most likely. I got the distinct impression that two groups were seen as the audience for the film: legislators and neurotypical parents of autistic kids. Another thing that rubbed me the wrong way about it was the employment section. Don't get me wrong; it was great that they highlighted people who had full time, productive jobs, but the impression was that menial jobs are the only ones available to those with autism. Home Depot, McDonald's, washing cars? Is that the best that they can hope for? Why did they not include profiles of, say, business analysts at Goldman Sachs? Autism Speaks had an opportunity to show the those with autism could do more than menial, low-wage jobs. Show the range of possibilities. Plus, as Susan Senator states in her post, not everyone can just start up a business focused on employing autistics. It's an inspiring story, but unrealistic for most of the people who might view this film. Autism Speaks once again fell into their old habit of using fear and negativity to drive their message. The folks picketing the screening out on the sidewalk have very good reason to be upset with AS. This organization purportedly works to unite everyone affected by autism, but this film seemed more focused on representing the family members who do not have autism than the people who are autistic. Thank you for viewing this film, I know I couldn't. I am truly sickened by AS's rhetoric for dollars and their meager contributions to help families like mine. You rightly pointed out all that is wrong with how they do business. Thank you for also validating the need to protest this organization. We are all also currently boycotting their sponsors with Twitter Bombs, phone calls and letters at boycottautismspeaks.com and #boycottautismspeaks. Everyday I go online and read the work of articulate, intelligent, and thoughtful bloggers like yourself and wonder why you aren't more widely read, there's so much nonsense written and said about autism and Autism Speaks leads the pack. Thank you for the review, well said. Thank you, Todd, for your sensitive and thorough liveblogging. I probably would have thrown my pen, pad, tablet or whatever across the room. Thanks Todd. I may never see the movie but it's nice to see a well thought out description of the movie with all the pros and cons. I'm kind of disturbed by this backlash against negative rhetoric/talk when real problems exist due to disability. Those on the severe end/those with higher impairment are the ones who need the attention as they are the ones who need help. The well off already get their praise. There are autistics who have troubles with even menial jobs. Not many have the aptitude to do advanced jobs, even though autistics have lots of ambition. It's not like the fortunate few on the spectrum even need others to get their skilled jobs for them. or have him be told he has ruined our lives! going base off of the photo? I have been diagnosed on the autism spectrum a few years ago after years of wondering what characterizes my permanent terrible problems. This is where I'm coming from. I just never understood why fear rhetoric is bad if there really are problems out there to address. If nobody is worried, who will do anything? Calling dramatic attention and concern to serious problems individuals have doesn't "dehumanize", because vulnerability really occurs within lives. It's not fair to call them burdens or blame them, but there are problems to complain of that autistics have to put up with. It's those with the condition who often are the ones suffering. Interpreting all negative rhetoric so personally doesn't mean all cruelty and offense would stop if the negative rhetoric just went away. The "diversity" advocates have fear/negative rhetoric of their own, as they trump up paranoia and irrational extreme characterizations of the basic goals of treatment and future cure. That doesn't reflect well on many autistics. Certainly not on me. I know what kind of characters go to those protests. I've been watching their "movement" for years. Not many of them are significantly disabled, and such advocates are overwhelmingly from the very high-functioning layer of the spectrum. When some of the posters they hold up bluntly say they can speak for themselves, that shouldn't be a surprise. There aren't many severe autistics who complain of negative rhetoric. Those advocates try to pull others in with heavily repeated loud but vague ideas, and promote a sense of belonging, at the same time as they creatively demonize cure entities. They don't have viable or helpful programs and haven't done much, besides complain. There's no need to get worked up at all of the things they complain of. It won't help. 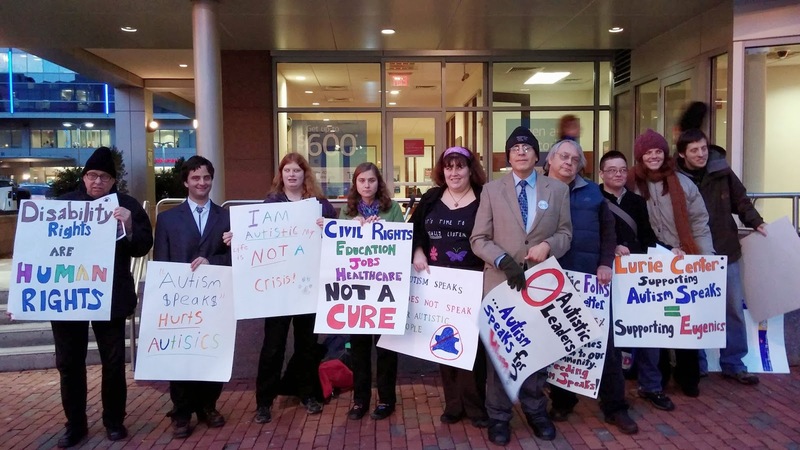 The anti-cure self-advocates and their unhelpful propaganda organizations don't represent me. I have gruesome problems they can't and would not even solve, and even have obligations of my own. Lowering expectations and encouraging us to be satisfied with less success or even without basic needs isn't a favor. Nobody else would be told to be happy with such a lot in life, while being deprived of the privileges they count on. I want something beyond just surviving on the sympathies of others, while they say saccharine things of me to boost their own reputations. Opposing cure/treatment is an uncalled for offense coming from those who are fortunate enough to prosper without one. what would be better, Lurker? I mean, being 11 and in diapers can be a challenge, but there are far worse things than that, hundreds of things worse than wearing diapers at 11 years old, like being a 21-year-old NT and driving drunk and not even getting a breathalyzer because you're answering the policeman's questions by singing "Skidamarinki dinky dink". If you, like the parents who made movies like "autism every day" or "i am autism", wanna know way worse things than having an autistic kid (which by the way isn't bad at all), you should go to Afghanistan and then you'll see NTs who can't wipe their butts with toilet paper, they have to use rocks. that's way worse than being autistic. Is there a point to what you're saying Nate? When those like you lose or cannot win a debate, you go off topic or demonize the person you're arguing with through some outrageous innuendo. You want to talk of hurling hate towards autistics with negative rhetoric? You imply that daring to call attention to core suffering due to disability and wanting it stopped, removes attention from and minimizes other problems that are real. Who is really making someone out to be expendable? If you really think nothing bad is going on at all due to disability within autism, why do you have to pretend to care about the various injustices of society to make this topic seem trivial in comparison? There's a difference between not recognizing existing disabilities and recognizing them in a way that's othering, stigmatizing and, if accompanied by action that matched that mentality, likely to make the problems worse. When the problems caused by sensory issues are framed as "I can't go to a social event with my child because it's embarrassing to me" and not "My child is in so much pain because of this situation and is doing everything in her limited power to cope," for instance, that shapes what treatment interventions and "cure" would look like. I would be honestly surprised to find an Autistic anywhere on the spectrum or of any ideology who WANTS to continue to have sensory issues or (most forms of) self-injurious behavior. The problem is that treatment and accommodation options are being created and framed by people who are not us, who are not like us, and who have their and not our priorities in mind. And thus far, that has led to a number of very bad things for the people who most directly deal with autism, both the good and the bad - namely, Autistic people. Shain, if the criticisms were genuinely limited to that, I wouldn't have a problem. I don't deny those concerns. It's not easy to avoid stigma even when malice isn't involved. I'm against the extreme positions that deprioritize treatments/cures that really would increase ability/functioning. lurker: well if you don't like it, then that's not anyone's problem but yours. as for the protest, i was there not physically but in spirit and i'm proud of them. Will Katie Wright one day be the voice of Autism Speaks? Or is she already? I’ve tried twice to submit this comment, using two different account types in case that was the issue, and it doesn’t seem to be working - the form just clears with no message as to whether the comment was submitted or not. I’m trying a different web browser this time to see if that helps. I apologize if it comes through multiple times as a result, but there’s been no indication thus far of whether it was submitted or not. Lurker - I understand where you're coming from, to some degree. The autism spectrum is very wide, and includes with a wide range of both challenges and strengths, and yes, the people who are more severely challenged do need more intensive support and assistance. I don't think anyone is denying that. But it's not as simple as them being the only ones who need help - or the only ones whose existence should be acknowledged in media regarding autism - and autistic people who are able to speak for themselves, perform non-menial jobs, etc. being a "fortunate few" who need no help and are unrepresentative of anyone else with autism. I don't have any statistics on hand for the exact prevalence of different forms of autism, but I think people often don't realize just how many people there are out there with the less obvious forms - just because those forms *are* less obvious. In the wake of my son's diagnosis, I was astonished to find out how many people I know - adults and children both - were autistic who I had not realized were. And the people with the less obvious and less severely disabling forms often *do* need support and accommodation. Some autistic people who are highly intelligent and highly verbal may still have significant challenges with things like sensory issues, anxiety, social interaction, etc. These may be less obvious, and less severely disabling, but they are still real issues, and whether or not support and accommodation can be found for them can make the difference between someone ending up a scientist or engineer, or on social assistance. There are autistic people who can "pass" as neurotypical, but find it so exhausting and stressful to have to do it all the time (suppressing stimming behaviours that they need to calm themselves, forcing eye contact even though it makes them uncomfortable, trying to remember all the rules of social interaction and appropriate behaviour, suppressing visible signs of discomfort when subjected to sensory overstimulation, etc.) that they end up having little energy left for anything else. But if there was more understanding and acceptance of autistic people, they wouldn't have to constantly fake it, and might be able to be far more productive and accomplish much more as a result. And the problem with all the negative rhetoric is that it contributes to stigma and discrimination against autistic people. When autism is constantly presented as something horrific and totally disabling, what employer is going to want to hire someone with autism? What autistic person is going to feel like they can be open about being autistic and do the things they need to do to stay calm and focused, instead of having to constantly suppress every difference no matter how exhausting it is? Not to mention how incredibly hurtful many autistic people find it to be constantly told that their existence is a disaster, a crisis, a tragedy, that their parents probably want to kill them, etc. Some of the things that Autism Speaks lobby for are obviously very valid and worthwhile, like insurance form, more support and assistance for autistic people and their families, etc. But I think there are ways to do this with more balance and responsibility, and more openness to input from the people most affected - not just parents, but autistic people themselves. I've listened to many of the successful high-functioning ones talk nonchalantly of their ordinary lives, not mentioning much difficulty. They usually only mention their problems when the unfair disparity between low/high functioning is emphasized to them. They generally have the means to help themselves and some have admitted they taught themselves the ways to interact socially. Sensory issues can be managed and dealt with, but those aren't an issue of impairment. There's no need to stop stimming anyway. But they're really not faking anything. They get to do things with other autistics and with neurotypicals they know, which they often actually like doing, yet many autistics don't have such an option to choose from. I wouldn't be trying to make a point of this if they weren't trying to make their troubles seem equivalent to the ones of those with severe problems. I don't worry of them not being productive enough. Behaviors and impairments that others don't understand and take advantage of cause stigma. That is mediated out in the open aside from any scary organization, even when this issue isn't being directly discussed. Negative acknowledgement of what disability is doing isn't the real problem. Employers don't listen to ad campaigns to make hiring decisions. The demonized negative rhetoric hasn't stopped successful autistics from getting what they need, cause they don't have many of the problems that are focused on by the negative rhetoric. Employers hire based on experience and the complete skill sets necessary for the positions. Employment for autistics wasn't higher before Autism Speaks was around. There really are other necessities to employment besides being open with one's innocuous differences. I never said listening to the lamentations of parents was comfortable and likable for autistics to listen to. Nobody wants to be hated in retaliation or blamed for their parents' sadness. Even if we want them to tone down or change their rhetoric, there still has to be a message sent out of the problems to convince donators to contribute. I know you are well meaning, but not all of the prominent autistic self-advocates have helpful goals in mind. "I've listened to many of the successful high-functioning ones talk nonchalantly of their ordinary lives..."
No, you haven't listened closely. You either didn't listen or you are purposely putting out a false image in order to discredit this community. If the former, please take the time to seek out some self-advocates voices. If the latter, please know that your efforts are transparent. You could also follow the research, say that of Paul Shattuck who has shown that autistics are much more likely to remain unemployed and to live with parents--even so called "high functioning" autistics. I note that most people who try to divide the world into "high functioning" and "low functioning" autistics are typically misrepresenting the viewpoint of adult self-advocates. I know what they say of what they do. It doesn't occur in a different reality. They don't have to make their prosperity any clearer. They admit what they have. They discredit themselves by misleading others and by accomplishing nearly nothing. I've debated them already. Basically none of them will concede to anything that strays from their ideology. I know what the research says over and over. When I say "high functioning", I mean the very high functioning, not all within that categorization. I mean the ones who don't still have significant impairments, who have their basic skills and who even have beyond average success. The division you mention is real. Nobody made it up or constructed it thorugh a concerted effort. They only say their viewpoint is misrepresented when someone sums it up for what it really is. I think a basic rule of argumentation is, if somebody says you have not understood or paraphrased their argument correctly, then you haven't. People tend to know what their own position is better than their opponents do. This principle applies to pretty much any political or philosophical context I can think of, by the way, not just autism issues. I have yet to encounter an autistic activist, verbal or otherwise, who did not frequently write about impairments in some area of life. Sensory, motor, speech, social, and executive function difficulties are frequently discussed on every self-advocate blog I have ever seen. I'm not sure where Lurker and others get the idea that there are autistic advocates without significant impairments. "The demonized negative rhetoric hasn't stopped successful autistics from getting what they need, cause they don't have many of the problems that are focused on by the negative rhetoric." Do you know how many Autistic children are out there thinking they can't contribute anything because that's what they're told? Do you think that those who have succeeded were the only ones who could do so? You are underestimating how many Autistics are capable, but suppressed by negative stigma, or held back from work or educational opportunities because neurotypical people think autism equates incapability or intellectual disorder, when it certainly does not. Why does no one look into the rates of depression in Autistics caused by hateful rhetorics? Can you imagine moving through a world that sees you so terribly when you yourself have given it no reason to do? Hateful rhetorics hold Autistics back every day... whether it be how it makes us feel about ourselves, or how it makes the people around us feel about us. Just because some of us rise up and face it, doesn't mean it has no effect on us. "mentioning how Autism Speaks invested $50 million in institutions in New England." Did she really use the term "institutions"? This has a very specific and negative connotation within most of the disability community.
" She mentions that lifetime treatment for one person will cost over $3 million. " She probably did not use the term "treatment". The $3M estimate includes lost earnings of the autistic and the parents, which is a large fraction of the estimate. In general, the Larie Marks Center is excellent. Sorry to hear that they give credence to the vaccine hypothesis. You dont get to tell anyone else that they arent REALLY Disabled. Not now, and not ever and certainly not because their experience of a simular diagnosis doesnt seem to come close enough to your own. Then why do they say virtually the same thing of themselves? When some of them admit that those around them don't notice any impairments/disability day in/day out. I wouldn't be calling them out like this, if they would just stop making this mess. If they stopped trying to undermine the already vulnerable goals of treatment/cure, in favor of what would barely amount to only palliative care, citing experiences like their own to justify it. Lurker, you have totally misread their situation. When some of them admit that those around them don't notice any impairments/disability day in/day out. The fact that their impairments aren't noticeable to others doesn't mean they don't have impairments. In fact, people not realising that they have impairments can cause further problems. Okay, you want a cure. Have I understood you correctly? Well, over the last almost four years I've read of "cures" like chelation, chemical castration and bleach enemas. They don't work and are abuse. I'm very suspicious whenever I hear talk of a "cure for autism". The best treatment for autistics appears to be applied behavioural analysis. That is not "palliative care", but a proven effective intervention. autismjungle, what kind of impairments could possibly be unnoticeable to others all of that time in various situations? I don't mean when others only see the results of an impairment and aren't aware that an impairment is the cause of that result. Those things you mention aren't cures, and aren't what Autism Speaks promotes, which is why they and the government still fund research that could lead to cures. There are many anti-cure advocates who are against ABA too. At least you approve of it. [W]hat kind of impairments could possibly be unnoticeable to others all of that time in various situations? Are you serious, lurker? I live on my own and at work, my workspace is concealed. It would be very easy to miss my problems. In fact, here's a story for you. One day, there was a social event that happened away from the client office. I looked up the address on Google Maps and set off. Unfortunately, Google Maps sent me to the wrong destination. I spent two hours frantically driving around, and arrived LATE. I was so stressed out that I nearly had a meltdown. In fact, after I arrived back home from the event, I HAD a full-scale meltdown. I lay down on my bed (still wearing my work clothes) and closed my eyes "for a few minutes". The next thing I knew, it was morning. Do you think my workmates knew about that? I never told them. Re my comment about "cures", did you miss the scare quotes? Finally, I'm going to reiterate what Sara said. "You don't get to tell anyone else that they aren't REALLY Disabled. Not now, and not ever and certainly not because their experience of a similar diagnosis doesn't seem to come close enough to your own." autismjungle, I'm sorry you had a bad day. What do you mean of scare quotes? By "scare quotes" I meant the inverted commas. They're also sometimes called "air quotes". I was trying to say that, although sold as cures, these things aren't really cures. Harpocrates, thank you for your coverage of the protesters and your important questions about Autism Speaks' fear-mongering film. You have a new fan. Lurker, I've argued that the people who are hurt most by Autism Speaks' tactics are those with the greatest support needs and the least independence--those who are often and disparagingly called "low functioning." http://mosaicofminds.blogspot.com/2013/11/autism-is-struggle-but-not-only-why.html If you listen to those few highly-disabled people who have access to communication methods--Amy Sequenzia, for example--you will find that those activists who are less disabled are basically saying the same thing as those who are more disabled. Or in other words, autistic people with limited disabilities are still better advocates for more severely-disabled autistic people than those of us who are not autistic. Lurker, I can kind of understand where you are coming from, but I stand by my assessment that the good things that AS does are overshadowed by their negative imagery and framing. Overall, they do more to create stigmas and fear of autism, let alone questions regarding how they spend the money they bring in. From what I've seen, they go through cycles of the type of behavior apparent in this film and occasionally seem to listen to the criticism, only to lapse back into the bad stuff again. As I said, I don't think that the negative aspects of autism should be glossed over or that the focus should only be on the positive, but the various issues around autism can be addressed in ways that do not stigmatize the spectrum of disorders or the people who have them. That said, I do feel I need to voice one criticism about the protesters. That sign over to the far right of the picture does them no good at all. Equating support of AS as support of eugenics is out of place and not supported by the evidence. When I saw that, and when some others I know saw that sign, the first thing that occurred to me was essentially that they are equating AS and the Nazis. It distracts from the valid criticisms they have. I most certainly did not choose to participate in this documentary for sympathy or fear inducing/promoting rhetoric. I most certainly don't see my child as a burden. I also think that it is paramount and urgent to get insurance reforms and mandates for coverage of autism services for families like my own. I can understand why purple would protest based on reading the fiscal matters of how Autism Speaks disperses funds if you feel you have been wronged. But, I would have been caught off guard showing up to this screening and seeing protesters for something that I feel is so necessary and urgent. We participated because a wanted to bring awareness and encouragement. Thank you for commenting. I wholeheartedly agree that insurance reform and improved access to supportive services is vital. And if AS had focused on that message, without inserting the fear- and burden-oriented rhetoric, I could have endorsed this movie without hesitation. Unfortunately, AS did what it has done all too often in the past, and for which it has been routinely criticized. That clouds the message and may do more harm than good for autistic individuals. Thank you for your response. Hopefully, our family will get to attend a screening soon. I do want to give you a heads up because you combined our story with another family. We did not pay $120,000 out of pocket. Our son is Bradley, not Shane. I don't think that really changes the nature of your take on the film or its prose and intent. Just wanted to give you a heads up. I'm very sorry for my mistake. Thank you for pointing that out. My notes got a bit jumbled as I was scribbling away furiously while trying to pay attention to the video. I have fixed my post. Again, my apologies. ^ purpose and intent. Not prose. Not a problem at all. I just didn't want to receive credit for paying that kind of money. We earn about $45,000/ yr. Until the fall when I'll gave my degree in Behavioral Psychology/Applied Behavior Analysis. Also, didn't want their son to be confused with ours. I'm sure it was pretty easy to get them mixed up while you were jotting everything down. You should see my notebooks. I wasn't trying to be a "you did that wrong" poster. I only found your blog because I was trying to find screenings. I hope you didn't take offense. I can delete the posts. What do people think of the Lurie Center programs? MGH wanted me to go theire for NLD and social skills.